I am on the Island of Koh Samet in the country of Thailand. It is maybe 150 Kilometers south of Bangkok. The cost of Internet has gone from 15 Baht in Khon Kaen, or 30 Baht in Bangkok to 120 Baht on the Island of Koh Samet. The word Koh means in the Thai language “Island” so everything an Island has Koh in front of it. We left from Khao San Road in Bangkok using a ticket for 225-260 Baht. 40 Baht more or less equals one dollar so this is about six dollars U.S. In the USA for the same distance between Chicago and Angola, Indiana cost me 35-40 U.S. Dollars. Therefore, as always most everything is five times cheaper. Thailand is one of the best values on the planet for most anything you wish to do; there are very few places cheaper than Thailand. I was very happy to get the large bus; a girl got of the bus and was suppose to be on the faster more comfortable mini-van. I have found these vans to be the most uncomfortable way of traveling in Thailand. They would be great if they did not over-load them and nothing works. The air is not working, the music is too loud, the driver is a nut, and I get carsick. 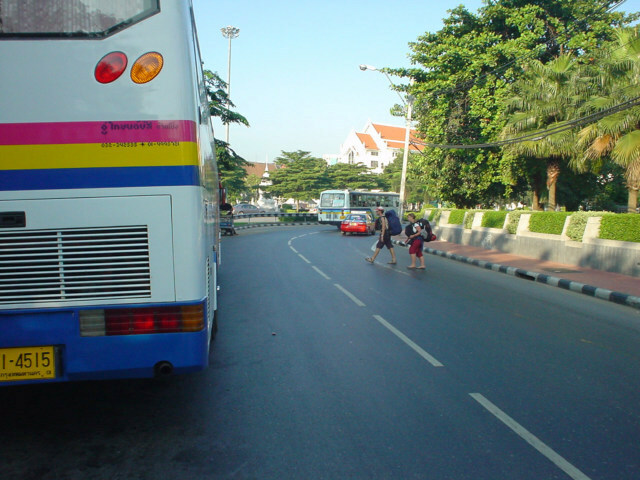 I believe there is no question in my mind, 95 percent of the time a big bus is better anywhere in Thailand. 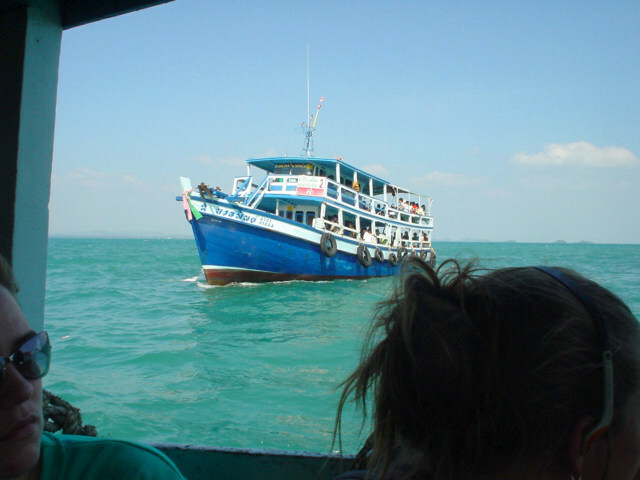 This is a photo of a typical ferry to Koh Samet, even though the girl got off the bus and went on the mini-van, whereby she arrived sooner, she still go got on our ferry and did not arrive faster. There are only ferries a few times and you cannot hurry up the leaving time by arriving sooner. 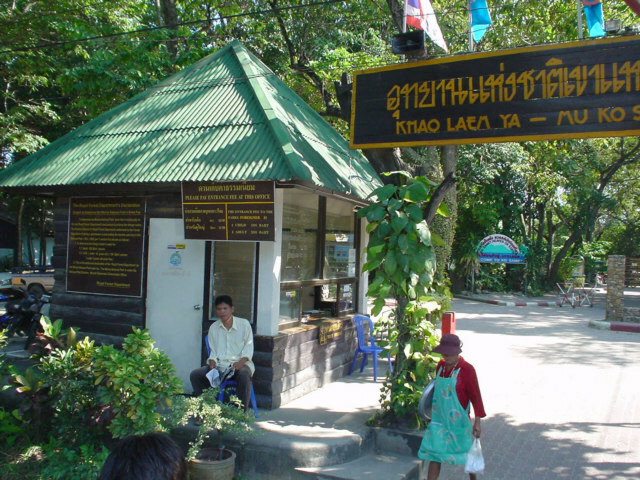 Here is where I get to pay 200 Baht or 5 Dollars U.S. to enter the park. I see this as a corrupt way to control development of the Island. The park if full of resorts and hotel, it is not really a protected park, other than it has the label on top of it, as I see it, they will eventually sell off all the spots in the park and then say it is not a park. Making it a park is good excuse for the Thai government to collect money, hard to say it does provides benefits, and there are many trucks and motorcycles inside the park and no obvious benefits, other than they get richer by extracting money. Thailand is Mexico with a twist. This is November; maybe the beach is longer or wider during some times of the years. However, for now there is no sandy dry beach. 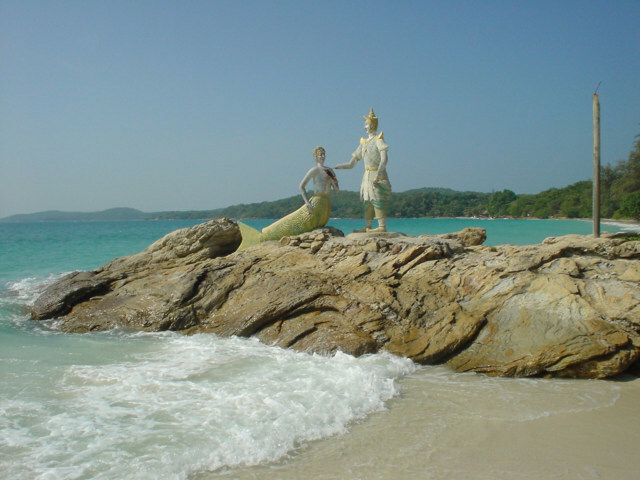 Koh Samet is mostly a beach for people who do not wish to lay on the beach and sun bath, I guess about 10 percent of the person on a beach actually want to lay around and sun bath, most either want to shop, drink, walk around sit in the shade. Most of the people that come to Koh Samet are Thai people it appears, I think on the weekend they come in droves and the prices rise. This is a perfect beach for Thai people as there still large trees and a lot of shade. Most of the time the locals cut down the trees for firewood, however somehow the trees have survived. The Thai people come to leave the city, party and try to say they were on an Island. However for sure the Thai people do not like the sun and will do anything to avoid becoming tan or darker skinned. I am looking for a beach closer to Bangkok, a beach I could go to in about 3 hours and stay easily. Pattaya is the obvious choice, however if I go to Pattaya there will always be this… “YOU are going for S E X.” Problem. Pattaya is the Thai Prostitute Capital of Thailand. However, is also one of the closest to Bangkok and easiest to visit beaches in Thailand? I have never been to Pattaya, even though I have been to Thailand maybe 15 times. I love the beach of Koh Pha Ngan; however, the torturous bus and boat trip of 15 hours more or less is a bit hard to get to the beach. I really would like an easier solution. 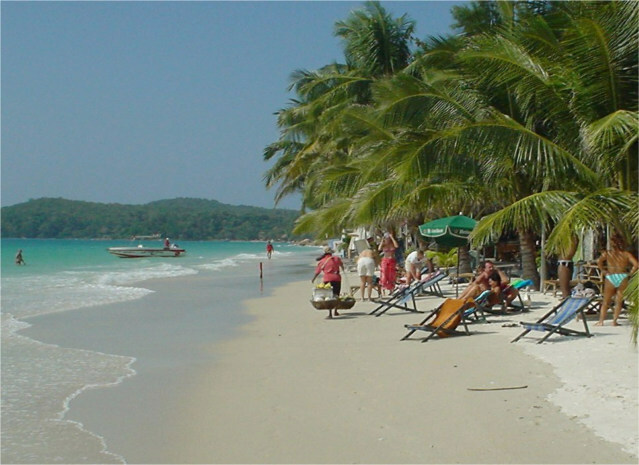 Phuket is more or less another S E X beach and Koh Samui is also pay-too-much to say you are a tourist beach. I am not sure what to do; I am thinking about going to a beach north of Pattaya and finding a play I can visit without saying Pattaya. When I mention the word Pattaya, there is an instant belief you are going there to buy S E X, so on this blog it really a nutty situation. A person will search on the internet find a page with the word Pattaya and instantly think I am here looking for the same as them and start writing. They will not read or try to figure out, I just suddenly get emails from people I do not want to talk with or hear from. The girls in the photos are lying on large rocks. 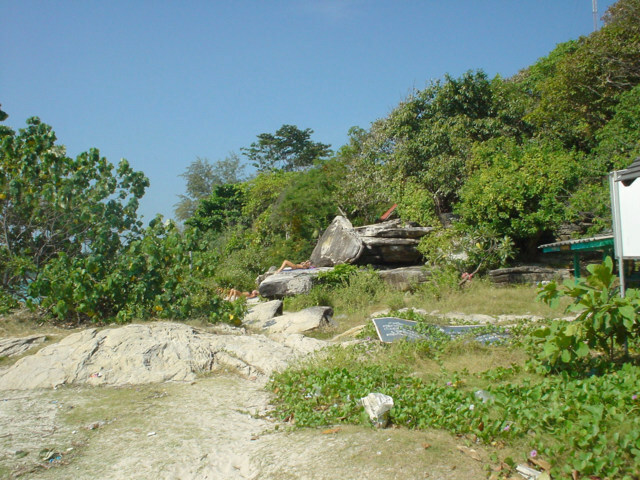 The reason for this is there is no beach that is dry on Koh Samet. I am not sure, and then they probably want more money to lie on a chair to stay out of the wet sand. All in all this is terrible place to lie in the sun, more of a place for a couple to lie around in a room for the weekend and go home. I am not going to return. However, for a lover’s weekend this is the perfect place, I am sure after 4 days they would be bored to death. There is some ancient and non-existent vision of Thailand. This is beautiful and they continue to place statues of something all over Thailand. This is the beach. This is a wide part of the beach. Notice the wet lines, when I choose a place to lay on the beach I look for dry sand. There are fleas in wet sand and the constant moisture of wet sand makes you towel soaked. Here there is tide so you will be moving constantly. A lounge chair is the solution however, you even move a little on this beach and you will be in the shade.